Ocean View Lanai, central AC, 5-10 min. walk to beach! Sleeps 4. Enjoy the comforts of home in this larger ocean-view one-bedroom corner condo with central A/C. You'll appreciate this condo's 536 sq.ft. plus 60 sq. ft ocean-view balcony/lanai with table and chairs! A long hallway separates the living area from the bedroom. We've rented at Waikiki Park Heights for over twelve years and this suite did not disappoint. Excellent stay as always." The property description accurate regarding the location, layout... We liked it and come back next time." THE PROPERTY IS WELL LOCATED , THIS IS THE FIRST YEAR I'VE USED THE BUS ,STOPS OUTSIDE WITH EVERY BUS YOU CAN THINK OF , IT WAS VERY HELPFUL TO SELECT A BUS NEEDED WITH ALL THE BUS SCHEDULES THAT WERE IN THE DRAWER. THE UNIT WAS CLEAN AND WITH THE LIVE ON SITE PROPERTY MANGER MADE MY CONCERNS OF A LATE NIGHT ARRIVAL EASIER THAT WE WON'T BE LEFT WAITING FOR SOME ONE TO ARRIVE AND LET US IN . WE WE ENJOYED OUR 10 DAY STAY AND WOULD COME BACK TO THIS UNIT "
Good position within easy walking distance of central Waikiki and the beach. The apartment was well provisioned with cooking equipment, bed linens, towels, beach towels, games (for kids and adults), cleaning stuff, etc. Bedroom has plenty of storage, but living area is a bit small for more than two adults. However, you are close to pretty much everything, and are you really in Waikiki to stay inside? The room was very clean and furnishings quite comfortable, even though the building and apartment are clearly quite old." From the 18th floor we enjoyed comfort, convenience, and wonderful views of the ocean as we relaxed in Hawaii. The apartment is in a great location - the beach is an easy 300m walk and there were beach towels and chairs for us to use. A mini supermarket is 5 minutes walk and there are many eating options in any direction. If you enjoy being in a lively active environment this is the place for you - we would happily stay here again. " Had a lovely holiday at Waikiki Park Heights #1812 which is a short walk to beach, has view of ocean, comfortable beds, clean and well presented with well stocked kitchen. I am looking forward to my next holiday in Honolulu where apartment #1812 will be my first choice of places to stay. " What a wonderful condo for 2 people, the separate bedroom was extremely spacious and the kitchen was well stocked with everything you need to have meals in your room. I appreciated the aboundance of towels including beach towels, since your just a few blocks from the ocean they came in handy. I was pleased to come across 2 beach chairs that we used daily and a box of ocean toys for all ages. We visit family in Waikiki yearly and I can guarantee I will be returning to this condo if it is available. " Everything was comfortable and the rep was unbelievably kind and friendly. While I was there they were updating the property and every time I crossed paths with the workers, they would stop for my convenience and sincerely apologize. The condo was perfect for two. The air conditioner wasn't as cool as I would have liked it, but my wife loved it that way. I used the fan that was there and we both had our way! I wish parking was a part of the deal, but I had to pay seperate and the price was low for Waikiki parking . I definitely would go back to this unit or use the management of Captain Cook Resorts via VRBO"
This apartment was lovely and quiet. We had beautiful views all around as it was an end apartment on the 18 floor. It was neat and tidy. Beds weren't the most comfortable to sleep on, everything else what a family needed." 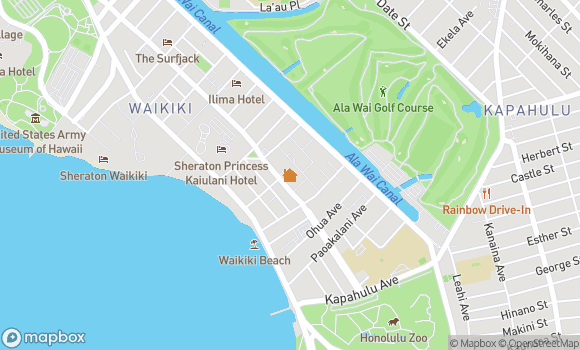 My family of three stayed in Room #1812 of Waikiki Park Heights for 7 days recently. Overall we were very pleased with our stay. The unit was a corner unit with lovely views on three sides. The lanai was pleasant with a table and three chairs. The bedroom was large and included a second television and two most comfortable rocker/recliner chairs, and the bed was extremely comfortable. Although the air con did not continue into the bedroom there was a very adequate fan in there which was very efficient. The lounge/kitchen was quite comfortable although a little small when the sofa bed was reclined, and the little table would only sit two people. Perfectly adequate for two people but would not like to have four adults in the unit. The kitchenette was perfect, with a microwave and full stove and every pot, pan or saucepan that you would every need is supplied. The unit was surprisingly very quiet with no traffic noise, except the occasional emergency vehicle of course. We were advised that there would be work going on around the complex, but if it was then it was very quiet and did not disturb us at all. The position of the complex was extremely good just a short walk to the beach and the bus stop, and the complex was very safe and secure. The property was very clean and well maintained and the staff helpful and friendly. The photos on the website of the unit were exactly how it was, what you see is what you get. Barbara met us downstairs and showed us to the unit and explained everything to us, she was very friendly and helpful and left us her contact number in case we had any problems, which we didn't. Would we stay there again? In a heartbeat and thoroughly recommend you check out this property for your next stay in Honolulu. " Very simple and convenient to arrange checkin and checkout. Although set back from the beach a bit, the view is nice, and we were fortunate to be there for a great fireworks show over the water." As always, my stay at WPH in Waikiki was wonderful. The views from my 18th floor corner suite are spectacular. Everything is always clean, well-equipped & organized. The location is the best - close to everything - beach, shopping, buses. I'm already looking forward to my next stay - which is already booked! Thanks to Barbara, Annella, Sherry-Lyn, Curtis, Robert & all the other wonderful staff who make my stay at WPH memorable....."
The condo was amazing! Beautiful views! It was exactly like the pictures. There isn't anything I would complain about! Great location. Quiet. We didn't want to leave. " Nov 21, 2016 - JOANNE and Sam R., LANGLEY, B.C. It was a nice condo in a great location. It had a decent view of the ocean and was close to all of the attractions, restaurants and night life. It had all of the amenities that we needed"
This location was perfect, just off the main drag but still very close to the action. Being on the end, you get views of both the mountains and the ocean. There is quick food just across the street that we stopped a couple times for a quick meal when there wasn't time to cook. I would definitely stay here again." Location was great but I would recommend it for two people not four because the sofa bed mattress was in a very poor condition, not sleep able at all. You could feel the springs poking on your back. Other amenities were good." You couldn't ask for a more central Waikiki location. Everything needed was provided from basic supplies like laundry and dish detergent to beach chairs and boogie boards. Although the kitchen/livingroom area was quite small, the bedroom was large. The views of the ocean, mountains, canal and city were great. The unit was clean and bright. When we called to ask about a late check-out as we had a 9:30pm flight, we were told we could stay as long as we wanted as they were not going to clean until the following day. Would highly recommend this unit and Captain Cook Real Estate." We had a wonderful stay in this apartment. It is in an older but well maintained building. The apartment is perfect for 2 persons, for 3 or 4 it's quite small (we were 3 adults). You don't need a car, waikiki beach, restaurants and shops are in walking distance and a bus stop is right on the street in front of the building. " We stayed 2 weeks in this flat and everything was perfect. " The apartment was in a great location with only minutes to the beach, restaurants and shopping area"
The representative (Barbara) was immediately reachable, pleasant and knowledgeable. The condo was well outfitted and had everything we needed. It was also well placed. We'd return here in a minute!" From the very start to securing the rental, through the holiday and then on to our departure, it was seamless and absolutely perfect. The condo was just ideal for me and my lovely wife of 45 years and we made the most of our 17 night stay. We satisfied the sanitation facilities, but we need a toilet seat with bidet that sprays water from underneath. The room has a nice view(ocean and mountain)!! And very airy room... no need AC. Close to everything, suited our needs perfectly"
The apt. is quiet, clean in a perfect position. Don't extpect too much space. If you open the second bed the 'livingroom' is full. but we enjoyed our stay. The property management is perfect. Very helpful and friendly. I would come back!" The medium rating for the property's general condition was due to the kitchen/living room area needing updating. The building itself is well maintained and security staff are appreciated." Our family of 4 enjoyed staying in Waikiki Park Heights #1812 during Christmas and New Year 2013/2014. When arriving at the reception we were immediately welcomed by the friendly and professional hostess. The apartment was well equipped and everything needed for a family vacation household was in place. The AC was well functioning at all times. There are nice views from both sides of the apartment and the walking distance to the beach, the shops, the restaurants etc are just minutes away. 4 minutes only to the bus stop, if needed. The Waikiki Park Heights security personnel was indeed very helpful and service oriented. We are happy to recommend this apartment to any couple or family looking for a centrally located Waikiki apartment. " We have stayed at Waikiki Park Heights five times and found #1812 to be the most satisfactory, although we were not unhappy with any of the others. It was very well-equipped and everything worked. " We thoroughly enjoyed our stay at the Waikiki Park Heights Condos. Very conveniently located to everything in Waikiki. Unless U absolutely need one for your own preference, U don't even need to rent a car. Everything is close and if U decide to do Hanauma, PCC, or a Luau, U can catch "The Bus" and it'll take U literally anywhere U wanna go. Condo itself was very nice with beautiful views of everything, ocean side or mountain side, U can see it from your lanai or right out your front door. I would stay here again in a heartbeat!! Mahalo Captain Cook staff, U made our trip a great time!!" Condo is in a great location and it is well furnished. We enjoyed our stay. If I visit Waikiki again, I would definitely like to rent this condo. I have already recommended it to my friends and family." The property is on Kuhio within a very short walk to Waikiki beach. In fact, if you are not careful, you will run right into the Duke and his surfboard! The property was a clean, one-bedroom condo with partial views of the ocean and the city. The place is secure and quiet. It is nice to come back to a/c when you've spent a few hours in the sun.You are not too far from any of the expensive or cheap restaurants. The bus stop is just down the road (we did not have a car). Enjoy the sunsets on the balcony. We would recommend this unit; we definitely enjoyed our stay here." Great place to stay with your family!" When we arrived we called Barbara who met us in the lobby and then showed us the apartment. Barbara took us through everything and explained all we needed to know about A/C, pool, keys etc... The unit is clean, well maintained and in a prime location, 2 minutes walk to the Duke statue and Waikiki beach. The apartment is well stocked with all essentials items including beach towels, beach chairs and a body board, so there is no need to purchase such items to enjoy your holiday stay. The unit has a great ocean view from the balcony and mountain views from the bedroom. Parking is an additional cost but worth it to avoid the hassle of trying to find parking close by. I would rent this apartment again and highly recommend it to friends." This condo was recommended to us from a friend. The agent we dealt with from the beginning was great (Barbara). It is an older condo but the condition is immaculate. The pull out couch was a little uncomfortable. The building was well maintained and the staff tried to be helpful if you asked questions. You could look out the window and see the surfers. The walk to the beach was 5 minutes. Convenient to nearby stores but very expensive for groceries. I would recommend this place to any of my friends and we would go back. " Will definitely try Captain Cook first for next stay. " The condo had everything one reqiured plus more.Great location, end condo lots of light with extra windows.Really really appreciated the extra time in condo." Well furnished and outfitted for renters. We had all that we needed. We cooked in most evenings and enjoyed dining on the patio - perfect for the three of us. The large bedroom made the unit comfortable for us. Views are outstanding in both directions. The corner unit is terrific. We enjoyed walking directly from the building past the zoo and parks to the summit of Diamond Head. Availability of public transportation was wonderful. We walked everywhere! Having the great pool made up for the very crowded beach area. The girls used it daily." Unit 1812 was great. An ocean view in Waikiki usually comes at a premium price. The lanai was a nice place to have meals. The bedroom and shower were huge. It's a short walk to the beach. The condo had everything we needed. We were very happy with it and will return here in the future." We have stayed in this bldg. quite a few times over the years and keep coming back due to it's excellent location and security features. The security staff are very friendly and it's good to see Ed there still. Annella has been involved with all our stays and it was nice to see her again. The view is excellent and you can check the clouds over the mountains and ocean without having to wait for a weather report. Good laundry facilities. Bus stop close by and some good restaurants that don't break your budget. " Nov 11, 2011 - Roy M., New Westminster, B.C. Clean and airy room, Full spec amenities, Near to the beach, convenient location for shopping, Nice securitiy guard guys. Everything requested is there. " "We had a great time. Both the accomodations and location were ideal. Fabulous weather which allowed for the ultimate in relaxation and revivification. Aug 31, 2011 - , Victoria, B.C. We felt very safe and comfortable while staying at this site. We knew if there was any problem that we would be able to count on Barb Sanderson to handle any situation. Curtis and Sherry, as well as the security staff of the building were fantastic. We really love our apartment, but we were hoping that they might put a tv in the bedroom?" Overall, this unit was great. It was very well-equipped with the essentials (ie kitchen pantry staples, basic toiletry items, & even some beach items). The lay-out is very functional & it makes good use of its square footage. As far as size goes, it was a bit bigger than many units in this building (since it was a corner unit) but we felt it was just barely big enough for 3 people. We didn't like the fact that it doesn't have a dishwasher, and that the master bedroom has a rather short bed (my husband who's 5'11' had to sleep diagonally). The location was very convenient but on a noisy street (which the balcony faces). The view from the balcony however is very nice. " Our room at the Waikiki Park Heights was very clean and was a perfect location for our week in Waikiki. The property manager, Barbara was very helpful. Their salt water pool was relaxing when we didn't want to use the beach. We loved being able to see everything from the lanai. The bed was comfortable and the kitchen well-stocked." Property was located at a great location to the beach. Pretty great views from the balcony and the walkway on the 18th floor. The room was adequate for the stay, it's located right in front once you get off the elevators. Lots of kitchen appliances to whip up almost anything you want to. Be aware only stove top, no oven. Microwave we used worked but did not spin correctly and made a funny noise. Thermostat reader seemed broken since it always read the temprature at 80 degrees. The shower needs a complete overhaul, tiles in the shower were a bit dingy. Showerhead definitely needs replacing. Bed and couch were comfortable. " "Perfect location This our 10th consecutive year Need we say more! Very cosey place to be in.Great location with a very nice view on the ocean. Only three blocks walk to the beach with shoping and Restaurants all around. " I would stay here again if it was just two people. The hide-a-bed needed a new mattress. I had to sleep on it made up as a love seat. A little too short for me and I am only 5'2". The unit could use some updating (lighting and cabinets) but it was clean and well equiped. I did not realize we would need to buy our own toliet paper so that was a little bit of a surprise. Barbara (property manager) was very helpful and friendly. I would recommend her and this property to others." We were overjoyed with the view of the ocean & surfers from the lanai. Only comment would be to have a divider/wall from our neighbour's lanai. The condiments & little extras left in the kitchen were much appreciated. Large bedroom & king size bed - wow. You will enjoy."